This article is about Constantine as an Emperor. For St. Constantine as a Saint, see Constantine the Great and Christianity. "Constantine I" redirects here. For other uses, see Constantine I (disambiguation). Constantine the Great (Latin: Flavius Valerius Aurelius Constantinus Augustus; Greek: Κωνσταντῖνος ὁ Μέγας; 27 February c. 272 AD – 22 May 337 AD), also known as Constantine I or Saint Constantine (in the Orthodox Church as Saint Constantine the Great, Equal-to-the-Apostles), was a Roman Emperor from 306 to 337 AD. Constantine was the son of Flavius Valerius Constantius, a Roman army officer, and his consort Helena. His father became Caesar, the deputy emperor in the west in 293 AD. Constantine was sent east, where he rose through the ranks to become a military tribune under the emperors Diocletian and Galerius. In 305, Constantius was raised to the rank of Augustus, senior western emperor, and Constantine was recalled west to campaign under his father in Britannia (Britain). 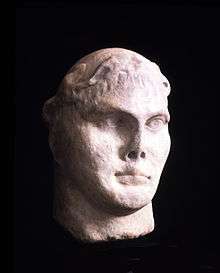 Acclaimed as emperor by the army at Eboracum (modern-day York) after his father's death in 306 AD, Constantine emerged victorious in a series of civil wars against the emperors Maxentius and Licinius to become sole ruler of both west and east by 324 AD. As emperor, Constantine enacted many administrative, financial, social, and military reforms to strengthen the empire. The government was restructured and civil and military authority separated. A new gold coin, the solidus, was introduced to combat inflation. It would become the standard for Byzantine and European currencies for more than a thousand years. 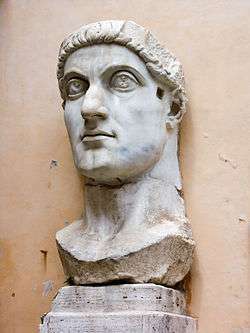 The first Roman emperor to claim conversion to Christianity,[notes 4] Constantine played an influential role in the proclamation of the Edict of Milan in 313, which decreed tolerance for Christianity in the empire. He called the First Council of Nicaea in 325, at which the Nicene Creed was professed by Christians. In military matters, the Roman army was reorganised to consist of mobile field units and garrison soldiers capable of countering internal threats and barbarian invasions. Constantine pursued successful campaigns against the tribes on the Roman frontiers—the Franks, the Alamanni, the Goths, and the Sarmatians—even resettling territories abandoned by his predecessors during the Crisis of the Third Century. Constantine is a significant figure in the history of Christianity. The Church of the Holy Sepulchre, built on his orders at the purported site of Jesus' tomb in Jerusalem, became the holiest place in Christendom. The Papal claim to temporal power in the High Middle Ages was based on the supposed Donation of Constantine. He is venerated as a saint by Eastern Orthodox, Byzantine Catholics, and Anglicans. 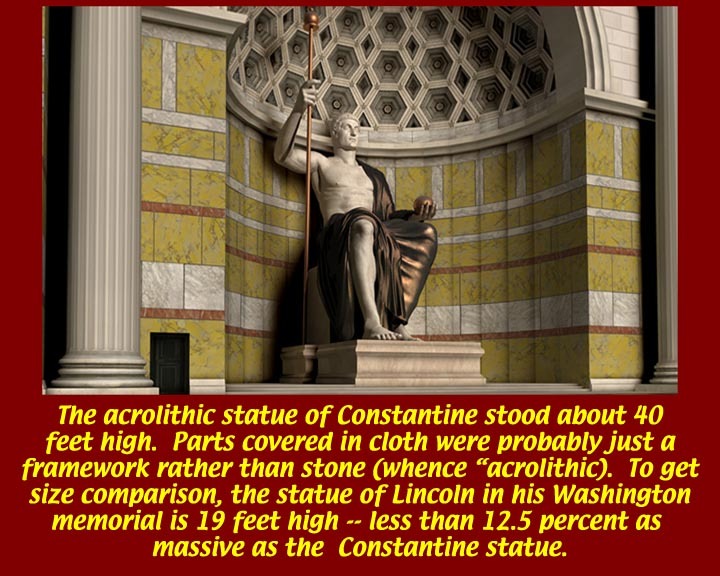 Constantine was a ruler of major historical importance, and he has always been a controversial figure. The fluctuations in Constantine's reputation reflect the nature of the ancient sources for his reign. These are abundant and detailed, but have been strongly influenced by the official propaganda of the period, and are often one-sided. There are no surviving histories or biographies dealing with Constantine's life and rule. The nearest replacement is Eusebius of Caesarea's Vita Constantini, a work that is a mixture of eulogy and hagiography. Written between 335 AD and circa 339 AD, the Vita extols Constantine's moral and religious virtues. The Vita creates a contentiously positive image of Constantine, and modern historians have frequently challenged its reliability. The fullest secular life of Constantine is the anonymous Origo Constantini. A work of uncertain date, the Origo focuses on military and political events, to the neglect of cultural and religious matters. Flavius Valerius Constantinus, as he was originally named, was born in the city of Naissus, (today Niš, Serbia) part of the Dardania province of Moesia on 27 February, probably c. 272 AD. 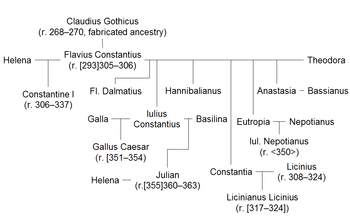 His father was Flavius Constantius, an Illyrian, and a native of Dardania province of Moesia (later Dacia Ripensis). Constantine probably spent little time with his father  who was an officer in the Roman army, part of the Emperor Aurelian's imperial bodyguard. Being described as a tolerant and politically skilled man, Constantius advanced through the ranks, earning the governorship of Dalmatia from Emperor Diocletian, another of Aurelian's companions from Illyricum, in 284 or 285. 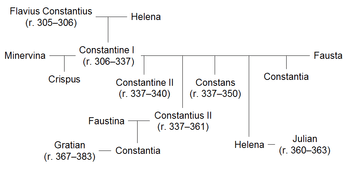 Constantine's mother was Helena, possibly a Bithynian woman of low social standing. It is uncertain whether she was legally married to Constantius or merely his concubine. It is unclear if Constantine could speak Thracian, his main language being Latin, and during his public speeches he needed Greek translators. From Bononia they crossed the Channel to Britain and made their way to Eboracum (York), capital of the province of Britannia Secunda and home to a large military base. Constantine was able to spend a year in northern Britain at his father's side, campaigning against the Picts beyond Hadrian's Wall in the summer and autumn. Constantius's campaign, like that of Septimius Severus before it, probably advanced far into the north without achieving great success. Constantius had become severely sick over the course of his reign, and died on 25 July 306 in Eboracum (York). 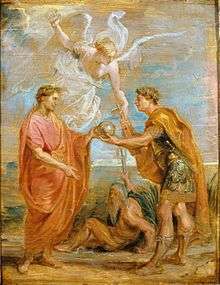 Before dying, he declared his support for raising Constantine to the rank of full Augustus. The Alamannic king Chrocus, a barbarian taken into service under Constantius, then proclaimed Constantine as Augustus. The troops loyal to Constantius' memory followed him in acclamation. Gaul and Britain quickly accepted his rule; Iberia, which had been in his father's domain for less than a year, rejected it. 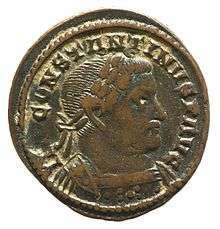 The portrait of Gaius Flavius Valerius Constantinus on a Roman coin. The inscription around the portrait is "Constantinus Aug[ustus]". Public baths (thermae) built in Trier by Constantine. More than 100 metres (328 ft) wide by 200 metres (656 ft) long, and capable of serving several thousands at a time, the baths were built to rival those of Rome. 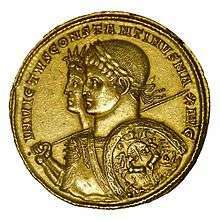 A gold multiple of "Unconquered Constantine" with Sol Invictus, struck in 313 AD. The use of Sol's image stressed Constantine's status as his father's successor, appealed to the educated citizens of Gaul, and it was considered less offensive than the traditional pagan pantheon to the Christians. By the middle of 310 AD, Galerius had become too ill to involve himself in imperial politics. His final act survives: a letter to the provincials posted in Nicomedia on 30 April 311 AD, proclaiming an end to the persecutions, and the resumption of religious toleration. He died soon after the edict's proclamation, destroying what little remained of the tetrarchy. Maximinus mobilized against Licinius, and seized Asia Minor. A hasty peace was signed on a boat in the middle of the Bosphorus. While Constantine toured Britain and Gaul, Maxentius prepared for war. He fortified northern Italy, and strengthened his support in the Christian community by allowing it to elect a new Bishop of Rome, Eusebius. Maxentius' rule was nevertheless insecure. His early support dissolved in the wake of heightened tax rates and depressed trade; riots broke out in Rome and Carthage; and Domitius Alexander was able to briefly usurp his authority in Africa. By 312 AD, he was a man barely tolerated, not one actively supported, even among Christian Italians. 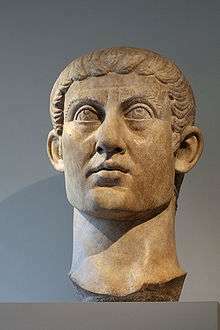 In the summer of 311 AD, Maxentius mobilized against Constantine while Licinius was occupied with affairs in the East. He declared war on Constantine, vowing to avenge his father's "murder". 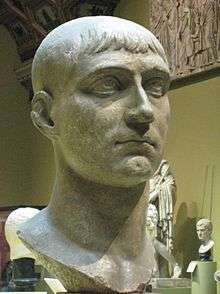 To prevent Maxentius from forming an alliance against him with Licinius, Constantine forged his own alliance with Licinius over the winter of 311–312 AD, and offered him his sister Constantia in marriage. Maximin considered Constantine's arrangement with Licinius an affront to his authority. In response, he sent ambassadors to Rome, offering political recognition to Maxentius in exchange for a military support. Maxentius accepted. According to Eusebius, inter-regional travel became impossible, and there was military buildup everywhere. There was "not a place where people were not expecting the onset of hostilities every day". 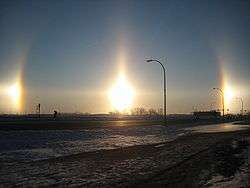 The description from 28th October 312, 'A cross centered on the Sun" fits with modern-day photographs of Sun dogs. Maxentius organized his forces—still twice the size of Constantine's—in long lines facing the battle plain, with their backs to the river. Constantine's army arrived at the field bearing unfamiliar symbols on either its standards or its soldiers' shields. According to Lactantius, Constantine was visited by a dream the night before the battle, wherein he was advised "to mark the heavenly sign of God on the shields of his soldiers ... by means of a slanted letter X with the top of its head bent round, he marked Christ on their shields." Eusebius describes another version, where, while marching at midday, "he saw with his own eyes in the heavens a trophy of the cross arising from the light of the sun, carrying the message, In Hoc Signo Vinces or "with this sign, you will conquer"; in Eusebius's account, Constantine had a dream the following night, in which Christ appeared with the same heavenly sign, and told him to make a standard, the labarum, for his army in that form. Eusebius is vague about when and where these events took place, but it enters his narrative before the war against Maxentius begins. Eusebius describes the sign as Chi (Χ) traversed by Rho (Ρ): ☧, a symbol representing the first two letters of the Greek spelling of the word Christos or Christ. In 315 AD a medallion was issued at Ticinum showing Constantine wearing a helmet emblazoned with the Chi Rho, and coins issued at Siscia in 317/318 AD repeat the image. The figure was otherwise rare, however, and is uncommon in imperial iconography and propaganda before the 320s. In the following years, Constantine gradually consolidated his military superiority over his rivals in the crumbling Tetrarchy. In 313, he met Licinius in Milan to secure their alliance by the marriage of Licinius and Constantine's half-sister Constantia. 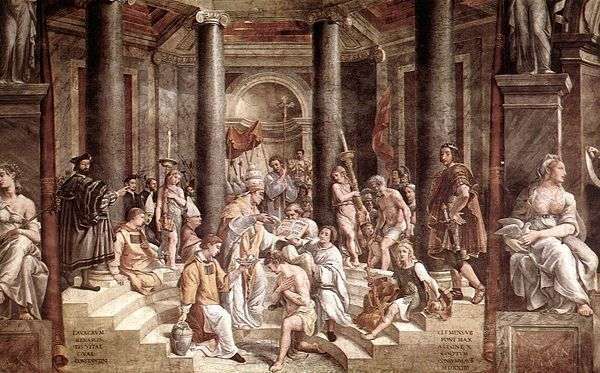 During this meeting, the emperors agreed on the so-called Edict of Milan, officially granting full tolerance to Christianity and all religions in the Empire. The document had special benefits for Christians, legalizing their religion and granting them restoration for all property seized during Diocletian's persecution. It repudiates past methods of religious coercion and used only general terms to refer to the divine sphere—"Divinity" and "Supreme Divinity", summa divinitas. The conference was cut short, however, when news reached Licinius that his rival Maximin had crossed the Bosporus and invaded European territory. Licinius departed and eventually defeated Maximin, gaining control over the entire eastern half of the Roman Empire. Relations between the two remaining emperors deteriorated, as Constantine suffered an assassination attempt at the hands of a character that Licinius wanted elevated to the rank of Caesar; Licinius, for his part had Constantine's statues in Emona destroyed. In either 314 or 316 the two Augusti fought against one another at the Battle of Cibalae, with Constantine being victorious. They clashed again at the Battle of Mardia in 317, and agreed to a settlement in which Constantine's sons Crispus and Constantine II, and Licinius' son Licinianus were made caesars. After this arrangement, Constantine ruled the dioceses of Pannonia and Macedonia and took residence at Sirmium, whence he could wage war on the Goths and Sarmatians in 322, and on the Goths in 323. In the year 320, Licinius allegedly reneged on the religious freedom promised by the Edict of Milan in 313 and began to oppress Christians anew, generally without bloodshed, but resorting to confiscations and sacking of Christian office-holders. Although this characterization of Licinius as anti-Christian is somewhat doubtful, the fact is that he seems to have been far less open in his support of Christianity than Constantine. Therefore, Licinius was prone to see the Church as a force more loyal to Constantine than to the Imperial system in general  – the explanation offered by the Church historian Sozomen. Constantine burning Arian books. Drawing from a 9th-century manuscript. In 326, Constantine reversed this pro-equestrian trend, raising many administrative positions to senatorial rank and thus opening these offices to the old aristocracy, and at the same time elevating the rank of already existing equestrians office-holders to senator, degrading the equestrian order —at least as a bureaucratic rank —in the process, so that by the end of the 4th century the title of perfectissimus was granted only to mid-low officials. 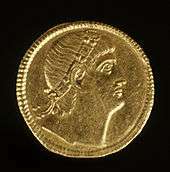 Constantine's monetary policy were closely associated with his religious ones, in that increased minting was associated with measures of confiscation—taken since 331 and closed in 336—of all gold, silver and bronze statues from pagan temples, who were declared as imperial property and, as such, as monetary assets. Two imperial commissioners for each province had the task of getting hold of the statues and having them melded for immediate minting—with the exception of a number of bronze statues who were used as public monuments for the beautification of the new capital in Constantinople. On some date between 15 May and 17 June 326, Constantine had his eldest son Crispus, by Minervina, seized and put to death by "cold poison" at Pola (Pula, Croatia). In July, Constantine had his wife, the Empress Fausta, killed in an over-heated bath. Their names were wiped from the face of many inscriptions, references to their lives in the literary record were erased, and the memory of both was condemned. Eusebius, for example, edited praise of Crispus out of later copies of his Historia Ecclesiastica, and his Vita Constantini contains no mention of Fausta or Crispus at all. Few ancient sources are willing to discuss possible motives for the events; those few that do, offer unconvincing rationales, are of later provenance, and are generally unreliable. At the time of the executions, it was commonly believed that the Empress Fausta was either in an illicit relationship with Crispus, or was spreading rumors to that effect. A popular myth arose, modified to allude to Hippolytus–Phaedra legend, with the suggestion that Constantine killed Crispus and Fausta for their immoralities. One source, the largely fictional Passion of Artemius, probably penned in the eighth century by John of Damascus, makes the legendary connection explicit. As an interpretation of the executions, the myth rests on only "the slimmest of evidence": sources that allude to the relationship between Crispus and Fausta are late and unreliable, and the modern suggestion that Constantine's "godly" edicts of 326 and the irregularities of Crispus are somehow connected rests on no evidence at all. 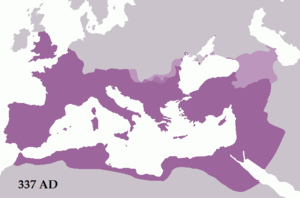 The Roman Empire in 337, showing Constantine's conquests in Dacia across the lower Danube (shaded purple) and other Roman dependencies (light purple). Bronze head of Constantine, from a colossal statue (4th century). Although he earned his honorific of "The Great" ("Μέγας") from Christian historians long after he had died, he could have claimed the title on his military achievements and victories alone. Besides reuniting the Empire under one emperor, Constantine won major victories over the Franks and Alamanni in 306–308, the Franks again in 313–314, the Goths in 332 and the Sarmatians in 334. By 336, Constantine had reoccupied most of the long-lost province of Dacia, which Aurelian had been forced to abandon in 271. At the time of his death, he was planning a great expedition to end raids on the eastern provinces from the Persian Empire. Serving for a total of almost 31 years (combining his years as co-ruler and sole ruler), he was also the longest serving emperor since Augustus and the second longest serving emperor in Roman history. The Byzantine Empire considered Constantine its founder and the Holy Roman Empire reckoned him among the venerable figures of its tradition. 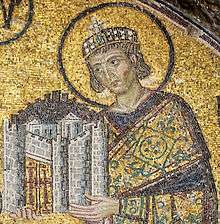 In the later Byzantine state, it had become a great honor for an emperor to be hailed as a "new Constantine". Ten emperors, including the last emperor of the Eastern Roman Empire, carried the name. 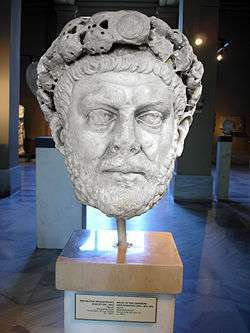 Monumental Constantinian forms were used at the court of Charlemagne to suggest that he was Constantine's successor and equal. Constantine acquired a mythic role as a warrior against "heathens". The motif of the Romanesque equestrian, the mounted figure in the posture of a triumphant Roman emperor, became a visual metaphor in statuary in praise of local benefactors. The name "Constantine" itself enjoyed renewed popularity in western France in the eleventh and twelfth centuries. 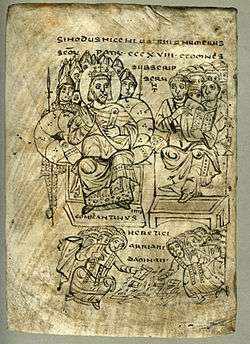 The Orthodox Church considers Constantine a saint (Άγιος Κωνσταντίνος, Saint Constantine), having a feast day on 3 September, and calls him isapostolos (Ισαπόστολος Κωνσταντίνος)—an equal of the Apostles. The Gothic History of Jordanes. 2006. Reprint of 1915 edition. Evolution Publishing. ISBN 978-1-889758-77-0. ↑ with the possible exception of Philip the Arab (r. 244–249). See Philip the Arab and Christianity. ↑ This translation is not very good. The pagination is broken in several places, there are many typographical errors (including several replacements of "Julian" with "Jovian" and "Constantine" with "Constantius"). It is nonetheless the only translation of the Historia Nova in the public domain. Essays from The Cambridge Companion to the Age of Constantine are marked with a "(CC)". 1 2 Birth dates vary but most modern historians use c. 272". Lenski, "Reign of Constantine" (CC), 59. ↑ Gregory, A History of Byzantium, 49. ↑ Van Dam, Remembering Constantine at the Milvian Bridge, 30. ↑ Barnes, Constantine and Eusebius, 272. ↑ Bleckmann, "Sources for the History of Constantine" (CC), 14; Cameron, 90–91; Lenski, "Introduction" (CC), 2–3. ↑ Bleckmann, "Sources for the History of Constantine" (CC), 23–25; Cameron, 90–91; Southern, 169. ↑ Cameron, 90; Southern, 169. ↑ Bleckmann, "Sources for the History of Constantine" (CC), 14; Corcoran, Empire of the Tetrarchs, 1; Lenski, "Introduction" (CC), 2–3. ↑ Barnes, Constantine and Eusebius, 265–68. ↑ Drake, "What Eusebius Knew," 21. ↑ Eusebius, Vita Constantini 1.11; Odahl, 3. ↑ Lenski, "Introduction" (CC), 5; Storch, 145–55. ↑ Barnes, Constantine and Eusebius, 265–71; Cameron, 90–92; Cameron and Hall, 4–6; Elliott, "Eusebian Frauds in the "Vita Constantini"", 162–71. ↑ Lieu and Montserrat, 39; Odahl, 3. ↑ Bleckmann, "Sources for the History of Constantine" (CC), 26; Lieu and Montserrat, 40; Odahl, 3. ↑ Lieu and Montserrat, 40; Odahl, 3. ↑ Barnes, Constantine and Eusebius, 12–14; Bleckmann, "Sources for the History of Constantine" (CC), 24; Mackay, 207; Odahl, 9–10. ↑ Barnes, Constantine and Eusebius, 225; Bleckmann, "Sources for the History of Constantine" (CC), 28–29; Odahl, 4–6. ↑ Barnes, Constantine and Eusebius, 225; Bleckmann, "Sources for the History of Constantine" (CC), 26–29; Odahl, 5–6. ↑ Bleckmann, "Sources for the History of Constantine" (CC), 27–28; Lieu and Montserrat, 2–6; Odahl, 6–7; Warmington, 166–67. ↑ Bleckmann, "Sources for the History of Constantine" (CC), 24; Odahl, 8; Wienand, Kaiser als Sieger, 26–43. ↑ Bleckmann, "Sources for the History of Constantine" (CC), 20–21; Johnson, "Architecture of Empire" (CC), 288–91; Odahl, 11–12. ↑ Bleckmann, "Sources for the History of Constantine" (CC), 17–21; Odahl, 11–14; Wienand, Kaiser als Sieger, 43–86. ↑ Barnes, Constantine and Eusebius, 3, 39–42; Elliott, Christianity of Constantine, 17; Odahl, 15; Pohlsander, "Constantine I"; Southern, 169, 341. ↑ Barnes, Constantine and Eusebius, 3; Barnes, New Empire, 39–42; Elliott, "Constantine's Conversion," 425–6; Elliott, "Eusebian Frauds," 163; Elliott, Christianity of Constantine, 17; Jones, 13–14; Lenski, "Reign of Constantine" (CC), 59; Odahl, 16; Pohlsander, Emperor Constantine, 14; Rodgers, 238; Wright, 495, 507. ↑ Odahl, Charles M. (2001). Constantine and the Christian empire. London: Routledge. pp. 40–41. ISBN 978-0-415-17485-5. ↑ Gabucci, Ada (2002). Ancient Rome : art, architecture and history. Los Angeles, Calif.: J. Paul Getty Museum. p. 141. ISBN 978-0-89236-656-9. 1 2 Barnes, Constantine and Eusebius, 3; Lenski, "Reign of Constantine" (CC), 59–60; Odahl, 16–17. ↑ Panegyrici Latini 8(5), 9(4); Lactantius, De Mortibus Persecutorum 8.7; Eusebius, Vita Constantini 1.13.3; Barnes, Constantine and Eusebius, 13, 290. ↑ Drijvers, J.W. Helena Augusta: The Mother of Constantine the Great and the Legend of Her finding the True Cross (Leiden, 1991) 9, 15–17. ↑ Barnes, Constantine and Eusebius, 3; Barnes, New Empire, 39–40; Elliott, Christianity of Constantine, 17; Lenski, "Reign of Constantine" (CC), 59, 83; Odahl, 16; Pohlsander, Emperor Constantine, 14. ↑ Tejirian, Eleanor H.; Simon, Reeva Spector (2012). Conflict, conquest, and conversion two thousand years of Christian missions in the Middle East. New York: Columbia University Press. p. 15. ISBN 0-231-51109-4. ↑ Barnes, Constantine and Eusebius, 8–14; Corcoran, "Before Constantine" (CC), 41–54; Odahl, 46–50; Treadgold, 14–15. ↑ Bowman, 70; Potter, 283; Williams, 49, 65. ↑ Potter, 283; Williams, 49, 65. 1 2 Barnes, Constantine and Eusebius, 3; Elliott, Christianity of Constantine, 20; Lenski, "Reign of Constantine" (CC), 59–60; Odahl, 47, 299; Pohlsander, Emperor Constantine, 14. ↑ Lactantius, De Mortibus Persecutorum 7.1; Barnes, Constantine and Eusebius, 13, 290. ↑ Barnes, Constantine and Eusebius, 3, 8; Corcoran, "Before Constantine" (CC), 40–41; Elliott, Christianity of Constantine, 20; Odahl, 46–47; Pohlsander, Emperor Constantine, 8–9, 14; Treadgold, 17. ↑ Barnes, Constantine and Eusebius, 8–9; Corcoran, "Before Constantine" (CC), 42–43, 54. ↑ Barnes, Constantine and Eusebius, 3; Lenski, "Reign of Constantine" (CC), 59–60; Odahl, 56–7. ↑ Barnes, Constantine and Eusebius, 73–74; Lenski, "Reign of Constantine" (CC), 60; Odahl, 72, 301. ↑ Barnes, Constantine and Eusebius, 47, 73–74; Fowden, "Between Pagans and Christians," 175–76. ↑ Constantine, Oratio ad Sanctorum Coetum, 16.2; Elliott, Christianity of Constantine., 29–30; Lenski, "Reign of Constantine" (CC), 60; Odahl, 72–73. ↑ Elliott, Christianity of Constantine, 29; Lenski, "Reign of Constantine" (CC), 61; Odahl, 72–74, 306; Pohlsander, Emperor Constantine, 15. Contra: J. Moreau, Lactance: "De la mort des persécuteurs", Sources Chrétiennes 39 (1954): 313; Barnes, Constantine and Eusebius, 297. ↑ Constantine, Oratio ad Sanctorum Coetum 25; Elliott, Christianity of Constantine, 30; Odahl, 73. ↑ Lactantius, De Mortibus Persecutorum 10.6–11; Barnes, Constantine and Eusebius, 21; Elliott, Christianity of Constantine, 35–36; MacMullen, Constantine, 24; Odahl, 67; Potter, 338. ↑ Eusebius, Vita Constantini 2.49–52; Barnes, Constantine and Eusebius, 21; Odahl, 67, 73, 304; Potter, 338. ↑ Barnes, Constantine and Eusebius, 22–25; MacMullen, Constantine, 24–30; Odahl, 67–69; Potter, 337. ↑ Oratio ad Sanctorum Coetum 25; Odahl, 73. ↑ Drake, "The Impact of Constantine on Christianity" (CC), 126; Elliott, "Constantine's Conversion," 425–26. ↑ Drake, "The Impact of Constantine on Christianity" (CC), 126. ↑ Barnes, Constantine and Eusebius, 25–27; Lenski, "Reign of Constantine" (CC), 60; Odahl, 69–72; Pohlsander, Emperor Constantine, 15; Potter, 341–342. ↑ Lactantius, De Mortibus Persecutorum 19.2–6; Barnes, Constantine and Eusebius, 26; Potter, 342. ↑ Lenski, "Reign of Constantine" (CC), 60–61; Odahl, 72–74; Pohlsander, Emperor Constantine, 15. ↑ Origo 4; Lactantius, De Mortibus Persecutorum 24.3–9; Praxagoras fr. 1.2; Aurelius Victor 40.2–3; Epitome de Caesaribus 41.2; Zosimus 2.8.3; Eusebius, Vita Constantini 1.21; Lenski, "Reign of Constantine" (CC), 61; MacMullen, Constantine, 32; Odahl, 73. ↑ Lenski, "Reign of Constantine" (CC), 61. ↑ Barnes, Constantine and Eusebius, 27; Elliott, Christianity of Constantine, 39–40; Lenski, "Reign of Constantine" (CC), 61; MacMullen, Constantine, 32; Odahl, 77; Pohlsander, Emperor Constantine, 15–16; Potter, 344–5; Southern, 169–70, 341. ↑ Barnes, Constantine and Eusebius, 27; Elliott, Christianity of Constantine, 39–40; Lenski, "Reign of Constantine" (CC), 61; Odahl, 77; Pohlsander, Emperor Constantine, 15–16; Potter, 344–45; Southern, 169–70, 341. ↑ Barnes, Constantine and Eusebius, 27, 298; Elliott, Christianity of Constantine, 39; Odahl, 77–78, 309; Pohlsander, Emperor Constantine, 15–16. ↑ Mattingly, 233–34; Southern, 170, 341. ↑ Barnes, Constantine and Eusebius, 27–28; Jones, 59; Lenski, "Reign of Constantine" (CC), 61–62; Odahl, 78–79. ↑ Barnes, Constantine and Eusebius, 28–29; Lenski, "Reign of Constantine" (CC), 62; Odahl, 79–80. ↑ Jones, 59; MacMullen, Constantine, 39. ↑ Barnes, Constantine and Eusebius, 28–29; Lenski, "Reign of Constantine" (CC), 62; Odahl, 79–80; Rees, 160. 1 2 Barnes, Constantine and Eusebius, 29; Elliott, Christianity of Constantine, 41; Jones, 59; MacMullen, Constantine, 39; Odahl, 79–80. ↑ Barnes, Constantine and Eusebius, 29. ↑ Pohlsander, Emperor Constantine, 16–17. ↑ MacMullen, Constantine, 39; Odahl, 81–82. ↑ Barnes, Constantine and Eusebius, 29; Elliott, Christianity of Constantine, 41; Lenski, "Reign of Constantine" (CC), 63; MacMullen, Constantine, 39–40; Odahl, 81–83. ↑ Odahl, 82–83. See also: William E. Gwatkin, Jr. Roman Trier." The Classical Journal 29 (1933): 3–12. ↑ Lactantius, De Mortibus Persecutorum 24.9; Barnes, "Lactantius and Constantine", 43–46; Odahl, 85, 310–11. ↑ Barnes, Constantine and Eusebius, 28. ↑ Panegyrici Latini 7(6)3.4; Eusebius, Vita Constantini 1.22, qtd. and tr. Odahl, 83; Rodgers, 238. ↑ Qtd. in MacMullen, Constantine, 40. ↑ Zosimus, 2.9.2; Lenski, "Reign of Constantine" (CC), 62; MacMullen, Constantine, 39. ↑ Barnes, Constantine and Eusebius, 29; Odahl, 86; Potter, 346. ↑ Barnes, Constantine and Eusebius, 30–31; Elliott, Christianity of Constantine, 41–42; Lenski, "Reign of Constantine" (CC), 62–63; Odahl, 86–87; Potter, 348–49. ↑ Barnes, Constantine and Eusebius, 31; Lenski, "Reign of Constantine" (CC), 64; Odahl, 87–88; Pohlsander, Emperor Constantine, 15–16. ↑ Barnes, Constantine and Eusebius, 30; Lenski, "Reign of Constantine" (CC), 62–63; Odahl, 86–87. ↑ Barnes, Constantine and Eusebius, 34; Lenski, "Reign of Constantine" (CC), 63–65; Odahl, 89; Pohlsander, Emperor Constantine, 15–16. ↑ Barnes, Constantine and Eusebius, 32; Lenski, "Reign of Constantine" (CC), 64; Odahl, 89, 93. ↑ Barnes, Constantine and Eusebius, 32–34; Elliott, Christianity of Constantine, 42–43; Jones, 61; Lenski, "Reign of Constantine" (CC), 65; Odahl, 90–91; Pohlsander, Emperor Constantine, 17; Potter, 349–50; Treadgold, 29. ↑ Barnes, Constantine and Eusebius, 33; Jones, 61. ↑ Barnes, Constantine and Eusebius, 36–37. 1 2 Barnes, Constantine and Eusebius, 34–35; Elliott, Christianity of Constantine, 43; Lenski, "Reign of Constantine" (CC), 65–66; Odahl, 93; Pohlsander, Emperor Constantine, 17; Potter, 352. ↑ Barnes, Constantine and Eusebius, 34. ↑ Elliott, Christianity of Constantine, 43; Lenski, "Reign of Constantine" (CC), 68; Pohlsander, Emperor Constantine, 20. ↑ Elliott, Christianity of Constantine, 45; Lenski, "Reign of Constantine" (CC), 68. ↑ Lactantius, De Mortibus Persecutorum 30.1; Barnes, Constantine and Eusebius, 40–41, 305. ↑ Barnes, Constantine and Eusebius, 41; Lenski, "Reign of Constantine" (CC), 68. ↑ Panegyrici Latini 6(7); Barnes, Constantine and Eusebius, 35–37, 301; Lenski, "Reign of Constantine" (CC), 66; Odahl, 94–95, 314–15; Potter, 352–53. ↑ Panegyrici Latini 6(7)1. Qtd. in Potter, 353. ↑ Barnes, Constantine and Eusebius, 36–37; Lenski, "Reign of Constantine" (CC), 67; Odahl, 95. ↑ Barnes, Constantine and Eusebius, 36–37; Elliott, Christianity of Constantine, 50–53; Lenski, "Reign of Constantine" (CC), 66–67; Odahl, 94–95. ↑ Lactantius, De Mortibus Persecutorum 31–35; Eusebius, Historia Ecclesiastica 8.16; Elliott, Christianity of Constantine, 43; Lenski, "Reign of Constantine" (CC), 68; Odahl, 95–96, 316. ↑ Lactantius, De Mortibus Persecutorum 34; Eusebius, Historia Ecclesiastica 8.17; Barnes, Constantine and Eusebius, 304; Jones, 66. ↑ Barnes, Constantine and Eusebius, 39; Elliott, Christianity of Constantine, 43–44; Lenski, "Reign of Constantine" (CC), 68; Odahl, 95–96. ↑ Barnes, Constantine and Eusebius, 41; Elliott, Christianity of Constantine, 45; Lenski, "Reign of Constantine" (CC), 69; Odahl, 96. ↑ Barnes, Constantine and Eusebius, 39–40; Elliott, Christianity of Constantine, 44; Odahl, 96. ↑ Barnes, Constantine and Eusebius, 38; Odahl, 96. ↑ Barnes, Constantine and Eusebius, 37; Curran, 66; Lenski, "Reign of Constantine" (CC), 68; MacMullen, Constantine, 62. ↑ Barnes, Constantine and Eusebius, 37. ↑ Barnes, Constantine and Eusebius, 37–39. ↑ Barnes, Constantine and Eusebius, 38–39; MacMullen, Constantine, 62. ↑ Barnes, Constantine and Eusebius, 40; Curran, 66. ↑ Barnes, Constantine and Eusebius, 41; Elliott, Christianity of Constantine, 44–45; Lenski, "Reign of Constantine" (CC), 69; Odahl, 96. ↑ Eusebius, Historia Ecclesiastica 8.15.1–2, qtd. and tr. in MacMullen, Constantine, 65. ↑ Barnes, Constantine and Eusebius, 41; MacMullen, Constantine, 71. ↑ Panegyrici Latini 12(9)2.5; Curran, 67. 1 2 Barnes, Constantine and Eusebius, 41; Odahl, 101. ↑ Panegyrici Latini 12(9)5.1–3; Barnes, Constantine and Eusebius, 41; MacMullen, Constantine, 71; Odahl, 101. ↑ Barnes, Constantine and Eusebius, 41; Jones, 70; MacMullen, Constantine, 71; Odahl, 101–2. ↑ Panegyrici Latini 12(9)5–6; 4(10)21–24; Jones, 70–71; MacMullen, Constantine, 71; Odahl, 102, 317–18. ↑ Barnes, Constantine and Eusebius, 41; Jones, 71; Odahl, 102. ↑ Barnes, Constantine and Eusebius, 41–42; Odahl, 103. ↑ Barnes, Constantine and Eusebius, 42; Jones, 71; MacMullen, Constantine, 71; Odahl, 103. ↑ Jones, 71; MacMullen, Constantine, 71; Odahl, 103. ↑ Jones, 71; Odahl, 103. ↑ Barnes, Constantine and Eusebius, 42; Jones, 71; Odahl, 103. ↑ Barnes, Constantine and Eusebius, 42; Jones, 71; Odahl, 103–4. ↑ Barnes, Constantine and Eusebius, 42; Jones, 71; Lenski, "Reign of Constantine" (CC), 69; MacMullen, Constantine, 71; Odahl, 104. ↑ Jones, 71; MacMullen, Constantine, 71. ↑ Barnes, Constantine and Eusebius, 42; Curran, 67; Jones, 71. ↑ Barnes, Constantine and Eusebius, 42; Jones, 71; Odahl, 105. 1 2 Barnes, Constantine and Eusebius, 42. ↑ MacMullen, Constantine, 72; Odahl, 107. ↑ Barnes, Constantine and Eusebius, 42; Curran, 67; Jones, 71–72; Odahl, 107–8. ↑ Barnes, Constantine and Eusebius, 42–43; MacMullen, Constantine, 78; Odahl, 108. ↑ Lactantius, De Mortibus Persecutorum 44.8; Barnes, Constantine and Eusebius, 43; Curran, 67; Jones, 72; Odahl, 108. ↑ Barnes, Constantine and Eusebius, 43; Digeser, 122; Jones, 72; Odahl, 106. ↑ Lactantius, De Mortibus Persecutorum 44.4–6, tr. J.L. Creed, Lactantius: De Mortibus Persecutorum (Oxford: Oxford University Press, 1984), qtd. in Lenski, "Reign of Constantine" (CC), 71. ↑ Eusebius, Vita Constantini 1.28, tr. Odahl, 105. Barnes, Constantine and Eusebius, 43; Drake, "Impact of Constantine on Christianity" (CC), 113; Odahl, 105. ↑ Eusebius, Vita Constantini 1.27–29; Barnes, Constantine and Eusebius, 43, 306; Odahl, 105–6, 319–20. ↑ Drake, "Impact of Constantine on Christianity" (CC), 113. ↑ Cameron and Hall, 208. ↑ Barnes, Constantine and Eusebius, 306; MacMullen, Constantine, 73; Odahl, 319. ↑ Cameron and Hall, 206–7; Drake, "Impact of Constantine on Christianity" (CC), 114; Nicholson, 311. ↑ Lenski, "Reign of Constantine" (CC), 71, citing Roman Imperial Coinage 7 Ticinum 36. ↑ R. Ross Holloway, Constantine and Rome (New Haven: Yale University Press, 2004), 3, citing Kraft, "Das Silbermedaillon Constantins des Grosses mit dem Christusmonogram auf dem Helm," Jahrbuch für Numismatik und Geldgeschichte 5–6 (1954/55): 151–78. ↑ Lenski, "Reign of Constantine" (CC), 71. ↑ Barnes, Constantine and Eusebius, 43; Curran, 68. ↑ Barnes, Constantine and Eusebius, 43; Curran, 68; Lenski, "Reign of Constantine" (CC), 70; MacMullen, Constantine, 78; Odahl, 108. ↑ "Portrait Head of the Emperor Constantine, Metropolitan Museum of Art, 26.229". Metmuseum.org. 2013-04-26. Retrieved 2013-05-11. ↑ Barnes 1981, p. 44. ↑ MacMullen, Constantine, 81; Odahl, 108. ↑ Cameron, 93; Curran, 71–74; Odahl, 110. ↑ Barnes, Constantine and Eusebius, 44; Curran, 72; Jones, 72; Lenski, "Reign of Constantine" (CC), 70; MacMullen, Constantine, 78; Odahl, 108. ↑ Barnes, Constantine and Eusebius, 44–45. ↑ Barnes, Constantine and Eusebius, 44; MacMullen, Constantine, 81; Odahl, 111. Cf. also Curran, 72–75. ↑ Barnes, Constantine and Eusebius, 45; Curran, 72; MacMullen, Constantine, 81; Odahl, 109. ↑ Barnes, Constantine and Eusebius, 45–46; Odahl, 109. ↑ Barnes, Constantine and Eusebius, 46; Odahl, 109. ↑ Barnes, Constantine and Eusebius, 46. ↑ Barnes, Constantine and Eusebius, 44. ↑ Barnes, Constantine and Eusebius, 45–47; Cameron, 93; Curran, 76–77; Lenski, "Reign of Constantine" (CC), 70. 1 2 Barnes, Constantine and Eusebius, 45. ↑ Barnes, Constantine and Eusebius, 47. ↑ Barnes, Constantine and Eusebius, 45; Curran, 76; Odahl, 109. ↑ Krautheimer, Corpus Basilicarum Christianarum Romanorum, 5.90, cited in Curran, 93–96. ↑ The term is a misnomer as the act of Milan was not an edict, while the subsequent edicts by Licinius—of which the edicts to the provinces of Bythinia and Palestine are recorded by Lactantius and Eusebius, respectively—were not issued in Milan. ↑ Pohlsander, Emperor Constantine, 25. ↑ Byfield, Ted, ed. The Christians: Their First Two Thousand Years, vol. III By This Sign. pg 148. "Archived copy". Archived from the original on 19 January 2016. Retrieved 2016-02-05. ↑ Pohlsander, Emperor Constantine, 38–39. ↑ Pohlsander, Emperor Constantine, 41–42. ↑ Pohlsander, Emperor Constantine, 42–43. ↑ Scarre, Chronicle of the Roman Emperors, 215. ↑ Petrus Patricius excerpta Vaticana, 190: Κωνσταντίνος εβουλεύσατο πρώτον εν Σαρδική μεταγαγείν τά δημόσια· φιλών τε τήν πόλιν εκείνην συνεχώς έλεγεν "η εμή Ρώμη Σαρδική εστι." ↑ Sardonyx cameo depicting constantine the great crowned by Constantinople, 4th century AD at "The Road to Byzantium: Luxury Arts of Antiquity". The Hermitage Rooms at Somerset House (30 March 2006 – 3 September 2006) Archived 1 January 1970 at the Wayback Machine. ↑ According to the Reallexikon für Antike und Christentum, vol. 164 (Stuttgart: A. Hiersemann, 2005), column 442, there is no evidence for the tradition that Constantine officially dubbed the city "New Rome" (Nova Roma or Nea Rhome). Commemorative coins that were issued during the 330s already refer to the city as Constantinopolis (Michael Grant, The Climax of Rome (London: Weidenfeld and Nicolson, 1968), 133). It is possible that the emperor called the city "Second Rome" (Deutera Rhome) by official decree, as reported by the 5th-century church historian Socrates of Constantinople. ↑ See Lactantius, De Mortibus Persecutorum 34–35. ↑ R. Gerberding and J. H. Moran Cruz, Medieval Worlds (New York: Houghton Mifflin Company, 2004) p. 55. Also, Percival J. On the Question of Constantine's Conversion to Christianity, Clio History Journal, 2008. ↑ "Gratian" Encyclopædia Britannica. 2008. Encyclopædia Britannica Online. Feb 3, 2008. ↑ R. Gerberding and J. H. Moran Cruz, Medieval Worlds (New York: Houghton Mifflin Company, 2004) pp. 55–56. ↑ Cf. Paul Veyne, Quand notre monde est devenu chrétien, 163. ↑ Richards, Jeffrey. The Popes and the Papacy in the Early Middle Ages 476–752 (London: Routledge & Kegan Paul, 1979) 14–15; The Popes and the Papacy in the Early Middle Ages 476–752 (London: Routledge & Kegan Paul, 1979) 15. ↑ Richards, Jeffrey. The Popes and the Papacy in the Early Middle Ages 476–752 (London: Routledge & Kegan Paul, 1979) p. 15-16. ↑ "CHURCH FATHERS: Life of Constantine, Book III (Eusebius)". ↑ Christol & Nony, Rome et son Empire, 247; Carrié & Rousselle L'Empire Romain, 658. ↑ Carrié & Rousselle L'Empire Romain, 658–59. ↑ Inscriptiones Latinae Selectae https://web.archive.org/web/20120720213655/http://oracle-vm.ku-eichstaett.de:8888/epigr/epieinzel_de?p_belegstelle=CIL+06%2C+01708&r_sortierung=Belegstelle. Archived from the original on 20 July 2012. Retrieved 5 February 2016. Missing or empty |title= (help); Carrié & Rousselle L'Empire Romain, 659. "Archived copy". Archived from the original on 20 July 2012. Retrieved 2016-02-05. ↑ Carrié & Rousselle, L'Empire Romain, 660. ↑ Cf. Arnhein, The Senatorial Aristocracy in the Later Roman Empire, quoted by Perry Anderson, Passages from Antiquity to Feudalism, 101. ↑ Cf. Paul Veyne, L'Empire Gréco-Romain, 49. ↑ Christol & Nony, Rome et son Empire, 247. ↑ De Rebus Bellicis, 2. ↑ Guthrie, 326; Woods, "Death of the Empress," 70–72. ↑ Guthrie, 326; Woods, "Death of the Empress," 72. ↑ Encyclopedia of Roman Empire. MobileReference.com. 2008. ISBN 978-1-60501-314-5. Retrieved 2014-10-05. ↑ Art. Pass 45; Woods, "Death of the Empress," 71–72. ↑ Barnes, Constantine and Eusebius, 250. ↑ Eusebius, VC 4.9ff, cited in Barnes, Constantine and Eusebius, 259. ↑ Barnes, Constantine and Eusebius, 258–59. See also: Fowden, "Last Days", 146–48, and Wiemer, 515. ↑ Eusebius, Vita Constantini 4.58–60; Barnes, Constantine and Eusebius, 259. ↑ Eusebius, Vita Constantini 4.61; Barnes, Constantine and Eusebius, 259. ↑ Eusebius, Vita Constantini 4.62. ↑ Eusebius, Vita Constantini 4.62.4. ↑ Pohlsander, Emperor Constantine, 75–76; Lenski, "Reign of Constantine" (CC), 82. ↑ Because he was so old, he could not be submerged in water to be baptised, and therefore, the rules of baptism were changed to what they are today, having water placed on the forehead alone. In this period infant baptism, though practiced (usually in circumstances of emergency) had not yet become a matter of routine in the west. Thomas M. Finn, Early Christian Baptism and the Catechumenate: East and West Syria (Collegeville: The Liturgical Press/Michael Glazier, 1992); Philip Rousseau, "Baptism," in Late Antiquity: A Guide to the Post Classical World, ed. G.W. Bowersock, Peter Brown, and Oleg Grabar (Cambridge, MA: Belknap Press, 1999). ↑ Marilena Amerise, 'Il battesimo di Costantino il Grande." ↑ Eusebius, Vita Constantini 4.64; Fowden, "Last Days of Constantine," 147; Lenski, "Reign of Constantine" (CC), 82. ↑ Sextus Aurelius Victor, Historiae abbreviatae XLI.16. ↑ Fowden, "Last Days of Constantine," 148–9. ↑ Pohlsander, Emperor Constantine, 75–76. ↑ Pohlsander, Emperor Constantine, 71, figure 9. ↑ Pohlsander, Emperor Constantine, 72. ↑ "Byzantine first & last times". Byzantium.xronikon.com. Retrieved 2012-11-07. ↑ "Barba – NumisWiki, The Collaborative Numismatics Project". Forumancientcoins.com. Retrieved 2012-11-07. ↑ Pohlsander, Emperor Constantine, 91. ↑ Pohlsander, Emperor Constantine, 92–93. ↑ Lieu, "Constantine in Legendary Literature" (CC), 305. ↑ "Niš: Vinik osta pusto brdo". 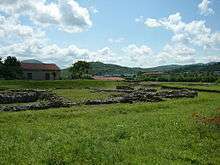 ↑ "Edict of Milan celebration to begin in Niš". 17 January 2013. ↑ Barnes, Constantine and Eusebius, 272–23. 1 2 Barnes, Constantine and Eusebius, 273. ↑ Johannes Leunclavius, Apologia pro Zosimo adversus Evagrii, Nicephori Callisti et aliorum acerbas criminationes (Defence of Zosimus against the Unjustified Charges of Evagrius, Nicephorus Callistus, and Others) (Basel, 1576), cited in Barnes, Constantine and Eusebius, 273, and Odahl, 282. ↑ Caesar Baronius, Annales Ecclesiastici 3 (Antwerp, 1623), cited in Barnes, Constantine and Eusebius, 274, and Odahl, 282. ↑ Edward Gibbon, The Decline and Fall of the Roman Empire Chapter 18, cited in Barnes, Constantine and Eusebius, 274, and Odahl, 282. See also Lenski, "Introduction" (CC), 6–7. ↑ Gibbon, Decline and Fall, 1.256; David P. Jordan, "Gibbon's 'Age of Constantine' and the Fall of Rome", History and Theory 8:1 (1969): 71–96. ↑ Jacob Burckhardt, Die Zeit Constantins des Grossen (Basel, 1853; revised edition, Leipzig, 1880), cited in Barnes, Constantine and Eusebius, 274; Lenski, "Introduction" (CC), 7. ↑ Lenski, "Introduction" (CC), 7. ↑ Lenski, "Introduction" (CC), 7–8. ↑ Barnes, Constantine and Eusebius, 274. ↑ Lenski, "Introduction" (CC), 8. ↑ Lenski, "Introduction" (CC), 8–9; Odahl, 283. ↑ Odahl, 283; Mark Humphries, "Constantine," review of Constantine and the Christian Empire, by Charles Odahl, Classical Quarterly 56:2 (2006), 449. ↑ Averil Cameron, "Introduction," in Constantine: History, Historiography, and Legend, ed. Samuel N.C. Lieu and Dominic Montserrat (New York: Routledge, 1998), 3. ↑ Lenski, "Introduction" (CC), 10. ↑ Lieu, "Constantine in Legendary Literature" (CC), 298–301. ↑ Constitutum Constantini 17, qtd. in Lieu, "Constantine in Legendary Literature" (CC), 301–3. ↑ Henry Charles Lea, "The 'Donation of Constantine'". The English Historical Review 10: 37 (1895), 86–7. ↑ Inferno 19.115; Paradisio 20.55; cf. De Monarchia 3.10. ↑ Fubini, 79–86; Lenski, "Introduction" (CC), 6. ↑ Henry of Huntingdon, Historia Anglorum, Book I, ch. 37. 1 2 Greenway, Diana (Ed. ); Henry of Huntingdon (1996). Historia Anglorum: The History of the English People. Oxford University Press. p. civ. ISBN 0-19-822224-6. ↑ "Watch The Full Program Online | From Jesus To Christ – The First Christians | FRONTLINE | PBS". www.pbs.org. Retrieved 2015-08-17. ↑ "HOME". www.christtoconstantine.com. Retrieved 2015-08-17. ↑ Roger Pearse, "Preface to the online edition of Zosimus' New History". 19 November 2002, rev. 20 August 2003. Retrieved 2009-08-15. ↑ This list of primary sources is based principally on the summary in Odahl, 2–11 and further lists in Odahl, 372–76. See also Bruno Bleckmann, "Sources for the History of Constantine" (CC), "Sources for the History of Constantine," in The Cambridge Companion to the Age of Constantine, trans. Noel Lenski, ed. Noel Lenski (New York: Cambridge University Press, 2006), 14–31; and Noel Lenski, ed. The Cambridge Companion to the Age of Constantine (New York: Cambridge University Press, 2006), 411–17. Firth, John B. "Constantine the Great, the Reorganisation of the Empire and the Triumph of the Church" (BTM). Retrieved 2016-02-19.